Koldinghus Castle is one of the center piece tourist attractions in Kolding, Denmark. Koldinghus is one of the few true castles remaining in Denmark, and it is the last remaining royal castle in Jutland. The picturesque castle is perched upon a hill dominating the downtown region of Kolding. The castle itself is well worth visiting, an added feature is the castle holds an excellent collection of Danish artworks, furniture and silverware from the last 450 years. Koldinghus is surrounded by a park and it has a small lake on the Northern side of the castle. It is a very pleasant area to go for a walk or to relax in the park. On the lake is one small boat which belongs to the current Queen of Denmark ‘Queen Margrethe II’, who is the only one who is allowed to sail on the lake. The tower offers an impressive view over Kolding. The castle is one of the finest attractions in Southern Denmark. There has been a castle on this location for more than 700 years. During this period the castle has undergone multiple restorations, additions and reparations. Not surprising due to the turbulent history in this region of Denmark. This region of Denmark has been heavily contested over the centuries, and it has the site of multiple wars with the Northern Germanic kingdoms. Not surprisingly Koldinghus served a very important role during these conflicts. Koldinghus was first founded by King Christoffer 1 in 1268. However, the oldest sections of the castle which are visible today date from the 1440’s. It is believed that a castle was first built on this location to help control the border with the Duchy of Schleswig. At the time the border ran from Koldingfjord along Kolding River. The construction of the castle added to Kolding’s importance as a center of trade, and the town rapidly expanded around the castle. The dominant castle help control the flow of trade both within Southern Denmark and over the border with the Duchy of Schleswig. The mid-14th century was a very turbulent time in Southern Denmark. Tensions were high with the Northern Germanic kingdoms, and the costs of maintaining the border were high. In 1320, King Christoffer II was forced to sign a charter by the Danish nobility who had grown tired of funding the costly defense of the border. The charter resulted in the demolition of the majority of the castles in Southern Denmark. Only Koldinghus and Riberhus remained. During the following years the castle fell into the hands of the Holstein counts on numerous occasions. 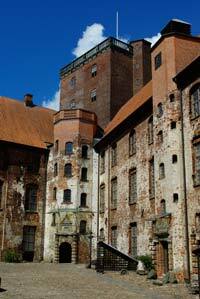 It wasn’t until 1348 that the castle was mortgaged back by Valdemar Atterdag (1340–75). Over the next 200 years Koldinghus underwent multiple renovations and additions. In the mid-16th century the castle was converted from being a pure medieval stronghold into more of a residential palace for the Kings and Queens of Denmark. Many of the defensive features of the castle were removed, the moat was filled in and the interior underwent major renovations to satisfy the decadent lifestyles of the King and Queens. This occurred primarily because the King’s and Queen’s would frequently visit the castle. During the same period a Protestant chapel was built within the castle. This reflects the endorsement of newly approved state religion. Unfortunately the protestant chapel was heavily damaged in 1581, and a new chapel was constructed by Denmark’s most famous King, ‘King Chrisitan the IV’. In 1808, during the Napoleonic Wars, Koldinghus suffered another great fire. At the time close to 30000 French and Spanish soldiers were stationed in Kolding. It is unknown how the fire started, but historians speculate that the castle heavily crowded with southern soldiers who were not use to the colder Scandinavian climate. Historical writing tells of soldier’s even burning furniture in an effort to stay warm. At some point a fire broke out which virtually destroyed the castle. Koldinghus lay in ruins for over a century, and it wasn’t until 1991 that the castle was fully restored. To the true purist a visit to Koldinghus can be mildly disappointing; many of the modern day restorations have not been focused on returning the castle to its former glory. Meaning that in order to save on restoration costs many of the internal parts of the castle are constructed with modern day materials and it can be difficult to get a true sense of being in a medieval castle. That being said the castle is still well worth a visit for tourists. The interior of the castle has many historical artworks from Denmark, and the castle frequently has changing exhibitions. The chapel which was constructed by King Christian the IV is very impressive, as is the castle grounds. As well as being a museum, Koldinghus Castle is often used as venue for important meetings and cultural activities. Koldinghus held the grand opening of the Nordic Synergy Park in April of 2012. The Synergy Park is to be an enormous technological park with the desire of creating 30000 jobs in Kolding over the next 25 years.